OTTAWA – MPs Jody Wilson-Raybould and Jane Philpott took their new seats among other Independents in the House of Commons Wednesday with their heads held high, while Prime Minister Justin Trudeau had to defend his feminist credentials and faced a silent protest from dozens of politically-engaged young women. “It’s very unfortunate that it’s come to this but we have to make difficult choices in politics and we aren’t always in control of all of the things that will happen, and happen to yourself when you’re in politics,” Philpott said, speaking to reporters next to Wilson-Raybould on their way into a question period that was dominated by questions about the pair’s ouster. “But you have to be able to hold your head high and look at yourself in the mirror at the end of the day and say that the choices that you made were the best ones under the circumstances,” she said. 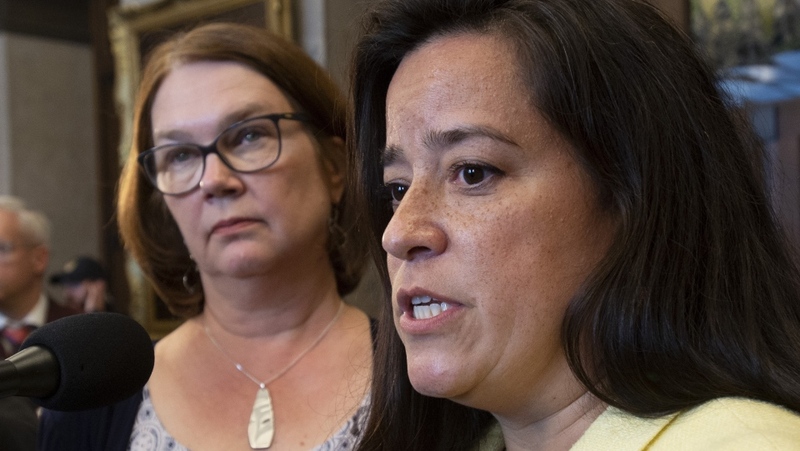 This included Wilson-Raybould secretly recording and then releasing a conversation she had with the clerk of the Privy Council on SNC-Lavalin, and Philpott saying there was more to the story than Trudeau was allowing to be said. Central to the affair are Wilson-Raybould’s allegations that when she was attorney general she faced attempted political interference from senior government officials to grant a deferred prosecution agreement to the Quebec construction giant rather than having its criminal trial continue, out of concern for jobs and the Liberal Party’s political prospects in Quebec. The government has consistently denied any wrongdoing, pointing to the fact that the DPA was not granted. Though, current Justice Minister and Attorney General David Lametti has not ruled out the possibility of still pursuing a deal with the company that’s facing fraud and corruption charges. Philpott said that while it’s been a "very difficult” few weeks, she defended her choices and decision to stand up for the “truth,” because she believes Wilson-Raybould’s version of events and couldn’t stand by while the rest of cabinet was lining up behind Trudeau’s denial of any wrongdoing. “To say that it’s good enough if something hasn’t broken a law, is a very, very low bar to hold,” she said. “Trust is a two way street… It is unconscionable to tread over the independence of the prosecutor, it is unconscionable not to uphold the rule of law,” she said, adding that she was alarmed that it seemed more people were concerned about the existence of the tape rather than the contents of it. During question period, both Conservative Leader Andrew Scheer and NDP Leader Jagmeet Singh pounced on the pair being punted from the party. “Why does telling the truth get you kicked out of the Liberal party?” Scheer asked as the first question of the day. Trudeau sought to address the underlying tensions head-on when he spoke to the hundreds of young women acting as MPs for the day, as part of the “Daughters of the Vote” event. 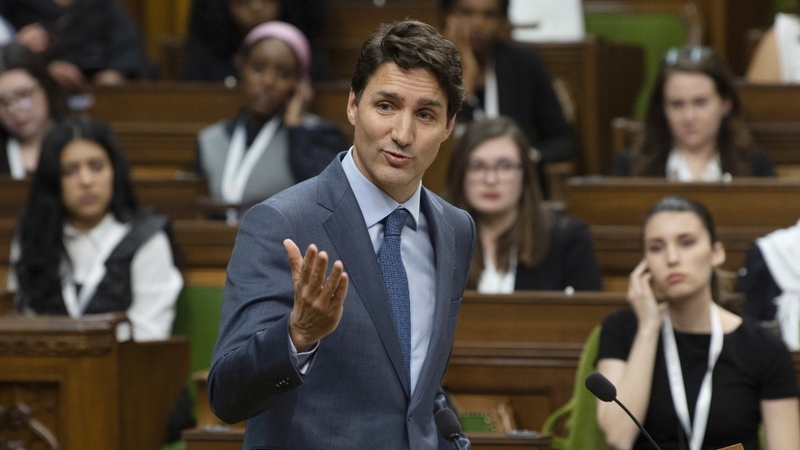 “We’ve seen in the news over the past number of weeks, a number of people with questions about disagreements within the Liberal party,” he said, referencing the latest chapter in the SNC-Lavalin scandal that has dogged his government for nearly two months. “There are always going to be a range of perspectives that we need to listen to, but ultimately diversity as we see right here in this room, diversity only works if there is trust and within a team, when that trust gets broken we have to figure out how to move forward,” Trudeau said. “I know nobody in here wants to have to believe between Jody Wilson-Raybould and Chrystia Freeland. Nobody wants to know that one person has to be right and the person has to be wrong between Jane Philpott and Maryam Monsef,” said Trudeau, comparing two of his current female cabinet ministers with two former ones. As Trudeau addressed the 338 delegates—each representing a different riding, and therefore from an array of political backgrounds— dozens of women on both sides of the chamber turned their backs to him. It was not immediately clear how many were protesting the removal of Wilson-Raybould and Philpott, or were instead expressing displeasure over the Liberals’ handling of other files. None of the handful of questions Trudeau took from the delegates were SNC-Lavalin related. 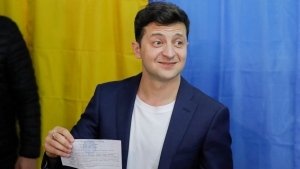 Some of the delegates who demonstrated said they thought it was a subtle and respectful way to show their dissatisfaction without interrupting the proceedings. Others were also seen walking out on Conservative Leader Andrew Scheer’s speech, which happened just prior to Trudeau’s remarks. Status of Women Minister Maryam Monsef said afterwards that she was “disappointed” to see women walk out on the Official Opposition leader and that she didn’t think it was respectful that others had their backs turned to Trudeau. Trudeau shot back saying that there is a range of “strong women” in “all seats” of the House who are “making a difference with what they deeply believe in,” and he hopes Singh didn’t mean to disparage them. Earlier in the day, after listening to the delegates’ Wednesday morning speeches, Wilson-Raybould said that she envisions a day when women can “speak truth” about important issues. She and Philpott spent their morning in the chamber listening to the young women who filled all the seats in the House of Commons for the special event, while their former Liberal caucus was meeting. “We have extraordinary leadership across the country in all of these young women and young leaders, however they identify themselves, have spoken truth about serious issues that are confronting our country, confronting politicians, and I actually envision one day where we speak about these really important issues, to speak truth about these important issues and have 338 members of Parliament working together to tackle them,” Wilson-Raybould said. Philpott, Wilson-Raybould and fellow former Liberal MP Celina Caesar-Chavannes — who removed herself from the caucus after speaking out about tensions between her and Trudeau during the SNC-Lavalin scandal — were seated next to each other in the public viewing gallery above. The trio were visibly emotional, as delegate after delegate of the event—organized by Equal Voice—stood to speak to the importance of encouraging women to enter politics, and about the importance of representation. With each speaker, the three once high-profile members of the Liberal caucus rose to applaud, wiping away tears as the women spoke about issues such as missing and murdered Indigenous women, racism, and other forms of marginalization. Trudeau faced questions on his way into Wednesday’s Liberal caucus meeting about whether the ouster of Philpott and Wilson-Raybould would damage his government’s feminist credibility. “We have an extraordinary range of extremely strong women in our caucus and in our cabinet who continue to work on big things for Canadians,” Trudeau said. Liberal MPs on their way into the meeting said that removing Philpott and Wilson-Raybould from caucus was not about their gender, but loyalty. “Our message is very clear to all the ‘Daughters of the Vote’ and all the women out there that want to take the risk to go into politics. You have a voice, you have a place and certainly you do so in our party,” said Liberal minister Melanie Joly. “The message is basically if you have a strong voice, we’re really, really willing to hear from you… At the same time, the message is, you know, when there is a breach of trust and you’re in a team, obviously, well, it’s difficult to continue to be part of a team,” Joly said. “This issue is about two members of Parliament… it’s not about female members,” said Liberal MP Jennifer O’Connell.